Julije Domac is the coordinator of the Croatian Biomass Use Programme (BIOEN) and the Leader of IEA Bioenergy Task 29 at the Energy Institute “Hrvoje Pozar”, Zagreb, Croatia. Varying conditions and a lack of relevant data make it difficult to apply standard methods for appraisal of employment and earnings from bioenergy, especially when more sophisticated theories are applied such as those including induced effects and multiplier effects. Formal-sector employment opportunities include both direct employment, comprising jobs involved in fuel or crop production, in the construction, operation and maintenance of conversion plants and in the transport of biomass; and indirect employment, comprising jobs generated within the economy as a result of expenditures related to biofuel cycles (Faaij, 1997). Human labour required for the production of biomass resources is about five times higher than that needed for the production of fossil fuels. 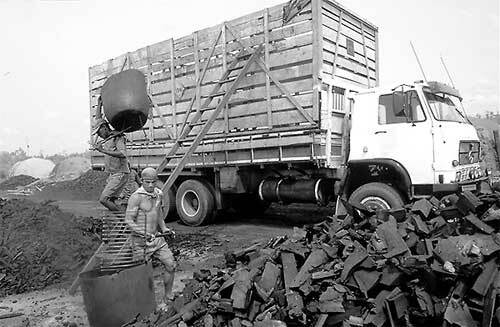 An analysis from Brazil has shown that charcoal production contributes to national employment with some 200 000 to 300 000 jobs (de Carvalho Macedo, 2002). The employment opportunities vary with the scale of the operation. A landowner who heats the family home and farm buildings with a wood-fired system will probably harvest the fuel supply from the family’s own woodlot using the family’s own labour. There are no wages involved, only “sweat equity”. The same landowner may also benefit from the sale of wood or from renting out equipment for production. In many countries agroforestry is becoming more widespread, with trees considered another crop in addition to grains, vegetables or forage crops (Hector, 2000). Do bioenergy systems provide earnings that are high enough to make it worthwhile to mobilize local resources to implement them? It is assumed, and possibly generally true for rural conditions, that some of the required resources (e.g. labour, machines, forests or forest residues, land, infrastructure and management capacity) would otherwise not be fully utilized. Moreover, the work is generally not performed under wage contracts, but by self-employed farmers, forest owners or local contractors whose interest is to get adequate earnings regardless of the source (whether personal labour, rental of machines or sale of biofuel). Job creation in bioenergy involves relatively low investment costs. Studies carried out in Brazil showed that bioenergy industries require an investement of between US$15 000 and $100 000 per job generated, compared with about US$800 000 per job in the petrochemical industry and over $10 million per job for hydropower (Carpentieri, Larson and Woods, 1993) (see Table 1). Although biomass-based employment has an impact primarily in rural areas of developing countries, it is also important in cities and in developed countries. European policy-makers recognize that renewables (in this case bioenergy) offer potential for employment creation in addition to environmental benefits. The renewable energy industry is one of Europe’s fastest growing sectors. A study carried out in 1998-1999 predicted that in the European Union the use of renewable energy technologies, including bioenergy, will more than double by 2020, and that this increase will lead to the creation of more than 800 000 jobs in the bioenergy sector by 2020 (Directorate General for Energy of the European Commission, 1999). The use of biomass for power or heat has the potential to create 323 000 jobs by 2020, while 515 000 jobs could be created in the provision of energy crops or forest or agricultural wastes as fuel. This predicted employment impact is far greater than that for other renewable energy sources (Table 2). The analysis assumed that expansion of biological fuel sources occurs without displacing employment in conventional agriculture and forestry. However, constraints pertaining to significant capital costs (Sims, 2002), the high cost of education and the availability of commercial technology all have to be overcome. In closing, it should be noted that at the local level bioenergy production and use may have other significant implications besides employment and monetary gains (social, cultural and environmental) which are not tractable to quantitative analysis and are therefore omitted from most impact assessments. Carpentieri, A.E., Larson, E.D. & Woods, J. 1993. Future biomass-based electricity supply in Brazil. Biomass and Bioenergy, 4(3): 149-179. Carvalho Macedo, I. 2002. Biomass energy in Brazil: a general overview. Presented at the International Workshop: Sustainable Bioenergy Production Systems: Environmental, Operational and Social Implications, Belo Horizonte, Brazil, 28 October - 1 November. Faaij, A.P.C. 1997. Energy from biomass and waste. Utrecht, the Netherlands, University of Utrecht. Hector, B. 2000. Forest fuels – rural employment and earnings. SE-750 07. Uppsala, Sweden, Swedish University of Agricultural Sciences, Department of Forest Management and Products. Sims, R.E.H. 2002. The brilliance of bioenergy – in business and in practice. London, UK, James & James Ltd.